The first thing that catches my eye at the entrance to “Beit Tzedec” is a large poster showing a group of men and women standing on a staircase. Two of them are holding a sign with the word YES. The title explains the context: it is a call for organ donation, explaining that this noble act is actually a mitzvah. The text below the image explains who the people in the photograph are. 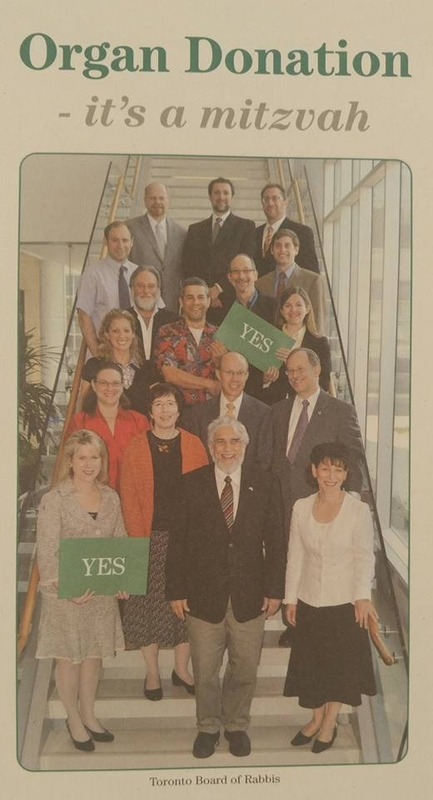 The people in the photograph are from the Rabbinical Council of Toronto. Conservative, Reform and Orthodox - men and women - who understand that it is more important to save lives than to quarrel. As the son of a man that underwent a kidney transplant (who was forced to travel all the way to Latvia to have the transplant performed) I could not help but get excited. I conclude a busy and empowering Saturday at the “Beit Tzedec” community, one of the three largest communities in the Conservative movement, and in fact one of the largest [Jewish] communities in the world. Two thousand and seven hundred families. Calculate how many people that means. There are several prayer halls, the largest of which is not large. It is huge. Almost 4,000 women and men. Prayers take place in three minyans (prayer ceremonies) every Saturday: a central minyan, led by a rabbi and a cantor; an active minyan, led on a voluntary basis by members of the community that rotate all the roles (shliach tsibur [lay prayer leader], Torah reader, Torah commentator, Gabai [synagogue manager]) and a semi-egalitarian Orthodox minyan, which found a home in Beit Tzedec. Interesting. “Tell me, what is the most difficult thing about leading such a large community?” I ask Rabbi Baruch Frydman-Kohl, Senior Rabbi of Beit Tzedec, who has been successfully filling this role for almost two decades. He smiles. In fluent Hebrew he explains that you cannot succeed in this type of position if you don’t love it, and do it. It's like a big factory. Like a giant hospital. Not a day goes by a birth, a funeral, without an event requiring rabbinical intervention. If a large community doesn’t know how to give the feeling of a small community, it’s not enough of a community. I watched him on Saturday and see how he does it. During the prayer he is not on the podium. He walks between the rows, touching, patting a shoulder, shaking hands, embracing. There is no one that he did not approach. In the middle of the Torah reading a young woman entered the synagogue hesitantly. She wore headphones on her ears and a black wire dangled from the headphones to a small electronic device attached to her belt. I tensed. It is the Sabbath. I wondered if the woman would receive a gentle hinted that it is unacceptable to enter a synagogue on the Sabbath like this. Rabbi Baruch approached her. He invited her to sit in one of the first rows and helped her adjust the small electronic device. The young woman is deaf. The synagogue provides a special device that attaches to the audio system on the podium, for people who are hard of hearing, thus making the prayer accessible also for people with disabilities. All of Israel’s prime ministers have visited Beit Tzedec, except Barak. He did not manage to. One member of the community is Al Gilbert, a famous Canadian photographer and one of the most well-known and sought after portrait photographers in the world. He was able to pose all of the prime ministers - from Ben Gurion to Netanyahu – in a uniform format for a portrait. I do not know how long each of them devoted to this portrait, but the result is astonishing. Exceedingly special portraits, each signed by the photographer. The portraits line one of the halls. But the most striking image is not a portrait. 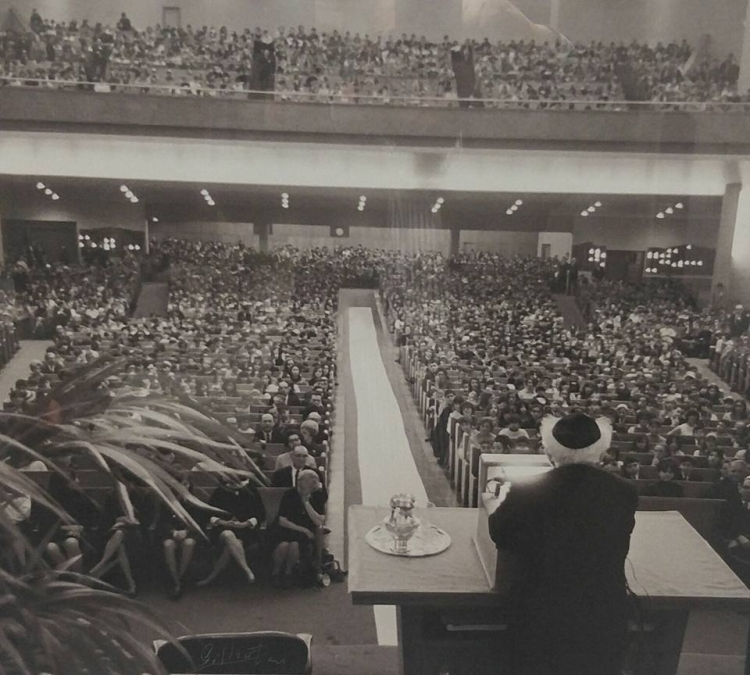 It is one of Ben Gurion addressing a full auditorium. Gilbert snuck up behind him, clicked his camera, and preserved a great moment in time. A small man with bushy white hair with a wrinkled black skullcap in the center, standing before four thousand people and talking about Zionism. He insisted on speaking with the youth separately, recounts Rabbi Baruch, as he relates the story of this visit as preserved in the legacy of the community. He encouraged them, in typically abbreviated Ben-Gurion style, to immigrate to Israel. Tomorrow. You belong there.Not here. Ben Gurion’s message was received with love, not with cynicism. The floor of the entrance lobby is an exact and spectacular replica, of the mosaic floor from the ancient synagogue in Beit Alfa, portraying the Zodiac, which adorned several synagogues in the Second Temple period. The Beit Tzedec community spent two years installing this mosaic, with precision craftsmanship. “Why?” What do you mean, “Why?” Because we educate that Israel is both in our hearts and before our eyes. Always. Indeed, the Beit Tzedec community is unabashedly and unapologetically Zionist. Criticism of Israel is expressed quietly, and with great pain. Almost in a whisper. " Sometimes, just like that, in “the middle of America ", you meet a community that blows you away. I'm in Austin, Texas. Congregation “Agudas Achim” led by Rabbi Neil Blumofe. The community was founded a little over a hundred years ago. 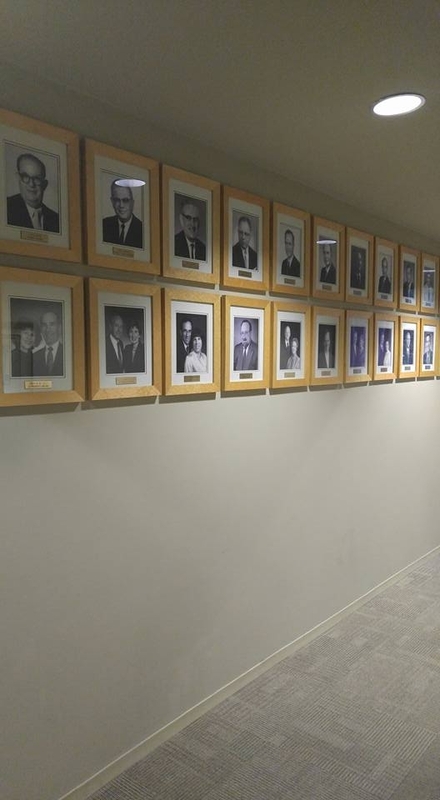 On the wall next to the Rabbi’s office you can see photos of the community presidents from the day of its inception (1914) and you cannot fail to be moved. At first, men, and only men, and then in the mid-seventies - couples (I've never seen a community in which so many married couples served together as presidents), and since then men and women alternately. 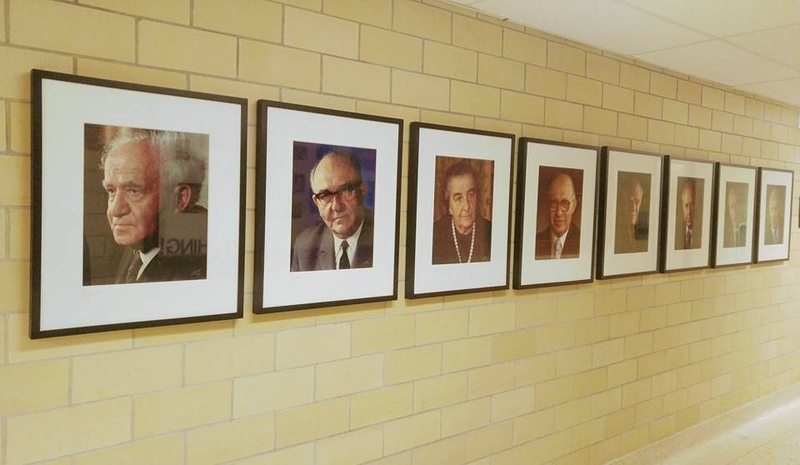 Photos of the male and female rabbis that served the congregation are featured on another wall, next to the magnificent prayer hall. The gender story celebrates its presence there as well, and I celebrate with it. These are the things that make my day. The new building (new at the time, currently there is already another) was inaugurated at the time by President Linden Johnson. This occurred on the December 30th, 1963. When he had first committed f to attending the ceremony, he was still vice president with time in his hands. However, on November 22nd, 1963, the presiding President (JFK) was murdered, and the Texan Johnson, which history will justly record as pivotal in the Revolution for equality of blacks in the US, became president. Community leaders contacted him and told him that they would absolutely understand if he was forced to cancel. He informed them that Texans do not cancel plans, and arrived as promised. This is a very Zionist community. It has members from AIPAC and from J Street, it is deeply committed to Israel and voic es criticism out of love. 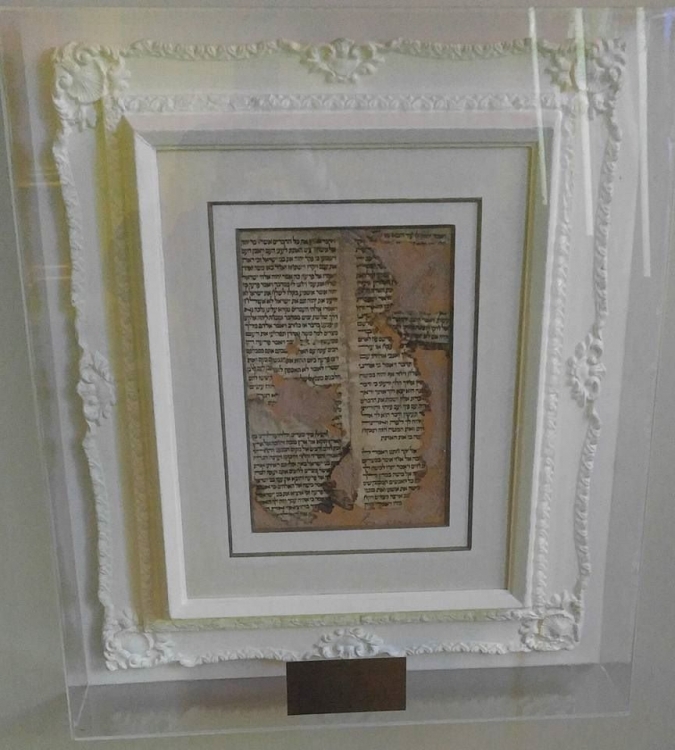 On the wall in the small prayer hall (there are two, one more beautiful than the other) the remains of a burnt Torah scroll from the “Hurva” synagogue are exhibited. The Hurva synagogue was set on fire following the fall of the Jewish Quarter in Jerusalem in 1948. It is chilling. Rabbi Blomofe - smart, articulate, sensitive, cool, and greatly admired, succeeded in the doubling the number of family memberships in the synagogue community within a decade, and now the number of families now number more than seven hundred and fifty. The kind of questions that I was asked (at a dinner with the board and at a lecture), were the type that only a knowledgeable and scholarly community that is committed to Israel would know how to ask. “You didn’t believe that you would find anything like this in Austin, Texas”, he tells me, and he is right.